Was the “Considerable Period” or the “Measured Pace” More At Fault? In his recent review in The New York Review of Books of my book Getting Off Track, Roger Alcaly makes a very interesting point about the “too low for too long” hypothesis, according to which the Fed helped cause the housing boom. I hear that some policymakers at the Fed have been thinking the same way in recent weeks. If so, then when the Fed starts increasing the interest rate, it is likely to do so faster than in 2004-2005. But first consider Roger Alcaly’s argument. 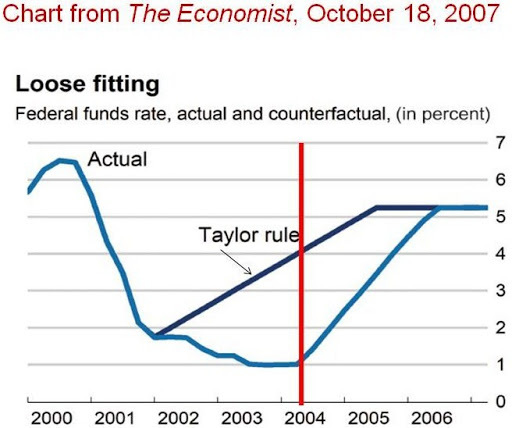 I have drawn in a red line in the chart below to indicate when the Fed started increasing the funds rate. Note that there is a big gap on both sides of the line. The cumulative deviations to the right of the red line (13.9 percentage points) are indeed sizeable as Alcaly argues. However, they are slightly smaller than the cumulative deviation on the left of the red line (15.5 percentage points). So at least by this measure there is no reason to be more concerned about a repeat of the “measured pace” period as there is a repeat of the “considerable period” period.